On Sunday 8th November we headed across the bridge to Fife to spend the day at the Falkland Estate. On arrival we had a ten minute walk through the autumn woods to get to the site. A lot of large rhododendron bushes had previously been cut down as they were preventing the native woodland from flourishing and so we were tasked with clearing this leafy foliage and burning it. 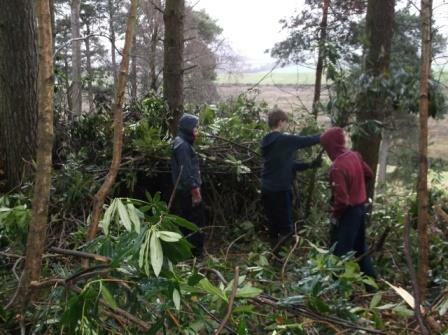 We split into three teams each with different jobs: starting the fire, sawing down the larger braches of rhododendron and collecting smaller sticks and braches for fire kindling. The day started off dry and we managed to get a good fire going but unfortunately as the rain came down heavier and heavier the little bonfire, despite lots of encouragement from us, suffered more and more. Despite the wet weather we all still enjoyed the day and being in the beautiful woods.